Kyiv, December 20, 2015. Despite the deterioration of the situation on the contact line, over the last day no Ukrainian military was killed or wounded. Yesterday, the fighting in the areas of the fiercest confrontation continued 24 hours. Altogether militants opened fire 63 times. However, the enemy used heavy weapons quite rarely, said Colonel Oleksandr Motuzyanyk, Presidential Administration spokesperson on ATO related issues during a briefing at Ukraine Crisis Media Center. According to him, in Luhansk sector militants intensified their activity in the Nyzhnyoteple – Schastya battle front. They fired from the right high bank of the Siversky Donets river. “Mostly small arms and grenade launchers were used. One shot from 120-mm mortar was also recorded,” added Colonel Motuzyanyk. Militants violated a cease-fire near the Novotoshkivske-Zholobok-Donetsky triangle on Bahmutska Road using 82-mm mortar once. In Donetsk sector at Svitlodarsk arch, they fired on the Ukrainian strongholds southward of Luhanske and Troyitske. The militants’ snipers fired there. 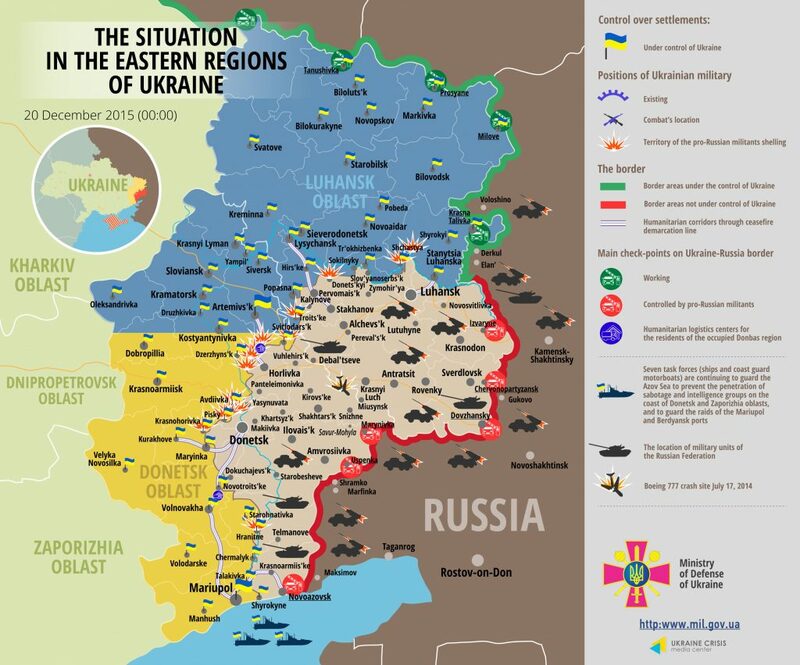 “The Donetsk airport area remains the epicenter of the confrontation. About half of all cease-fire violations happened in the front sector from Avdiivka to Pisky,” informed Oleksandr Motuzyanyk. The sniper was firing during almost an hour on the western outskirts of Horlivka. He also noted that the smallest activity of illegal armed groups is recorded in Mariupol sector. Two aimed shots from small arms were recorded in Krasnohorivka, and two – in Granite. In Maryinka, the National Police took measures against acts of sabotage. “Police squads patrolled the streets, checking the likely locations of wanted persons, carried out thorough checks of vehicles and documents of citizens,” explained Oleksandr Motuzyanyk. As a result of the operation, they detained a man who was a manager of the warehouse of fuels and lubricants of so-called “Donetsk People’s Republic”. Another militant was detained at the checkpoint near Komyshuvakha in Luhansk region. The detainee was transferred to the police operative group. Another militants’ accomplice took part in the Ukrainian State Security Service program “They wait for you at home” and surrendered. Paratroopers of the 95th separate airborne brigade greeted students of the Slovyansk boarding school on the occasion of St. Nicholas Day. “Ukrainian soldiers gave the children sweets from volunteers from Zhytomyr and Kyiv regions,” added the spokesman on ATO-related issues.